Science is always evolving, and with the passing of time a lot of new knowledge is gained, and old knowledge reviewed. Perceptions of a known and trusted vaccination policy have certainly changed over the last couple of years. Until recently it was common to vaccinate puppies and dogs according to a specific schedule. In the Netherlands puppies were vaccinated at 6, 9 and 12 weeks old, and this vaccine would be repeated every year by means of the cocktail. This cocktail consists of DHP (Distemper, Hepatitis and Parvo), often Kennel Cough and a vaccine against Weil’s Disease. Besides those, some dogs would also be vaccinated for rabies. Nowadays perceptions have changed and science has shown that vaccines do not necessarily have to be repeated on a yearly basis. Cocktails are being given every three years now, and the same goes for the rabies vaccine. The only vaccine that has to be repeated every year is the one for Weil’s Disease, also known as leptospirosis. What is the importance of vaccination? Vaccination has been a much debated topic the past couple of years, and it appears that vaccinating is not limited to positive aspects only. Furthermore is it becoming clear that the effect of certain vaccinations last much longer than was previously assumed. Let me make myself clear: it is a good thing vaccinations exist, they are the main reason some diseases have all but disappeared. However, I think we have to acknowledge vaccinations have a downside as well. Thanks to vaccinations certain diseases have become very rare in the Netherlands, but it is because of this scarcity that dogs do not encounter those diseases ‘in the field’, which makes it almost impossible for them to compose immunity on their own. This makes dogs vulnerable, because it makes them more or less dependent on the vaccines to build up antibodies against something that is hardly a threat because of its rarity. Odd as it may sound, vaccination’s success increases the need to vaccinate. This is a strange, artificial situation, and not completely harmless at that. Especially since it has become clear that certain vaccinations do not need to be given as frequently as was commonly done, we are facing the fact that dogs were vaccinated excessively for many years. What is the risk of vaccination? Every vaccination harms a dog’s immune system. This is necessary to urge the body to make antibodies against diseases. Vaccines sometimes contain weakened or dead pathogens. They may not or hardly cause illness in our dogs, but they do cause the immune system to produce antibodies, which was exactly the point in the first place. However, because the immune system is repeatedly and artificially weakened, vaccinations are also harmful for the dog’s body. Especially with the large cocktail multiple pathogens are injected at the same time: Distemper, Hepatitis, Parvo, Weil’s Disease and occasionally Kennel Cough. This is quite an assault on the dog’s body. Most dogs sustain this effortlessly, some dogs are a bit down for a day or so, but some dogs become very ill. Oftentimes it is not the vaccine itself the body responds to, but the auxiliary matters found in the vaccines. In some cases this will not show until much later, which makes it hard to make a connection to the vaccinations. In these cases autoimmune diseases and allergies are often mentioned. The current vaccine against Leptospirosis (L4) is globally controversial regarding this matter. 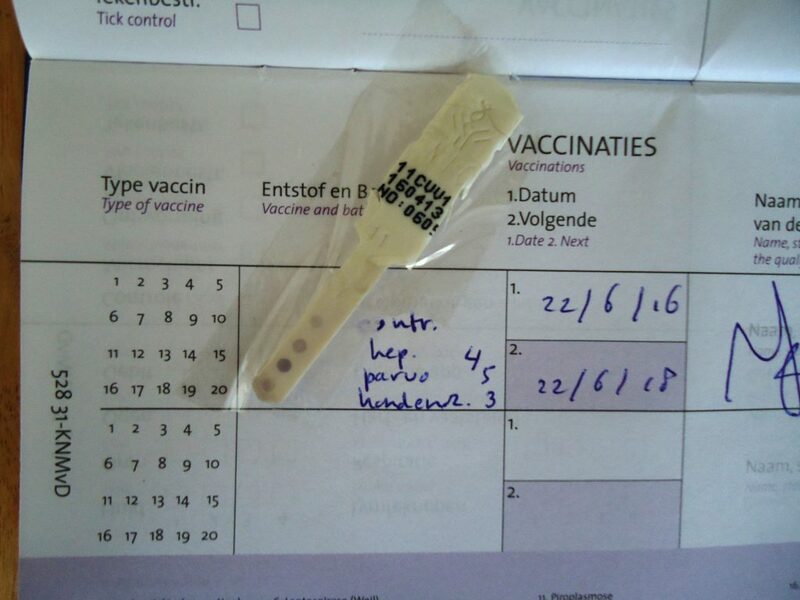 Fortunately tailored vaccination is possible in the Netherlands. This concept is given more and more attention, which in itself increases the opportunity to do so. When customising vaccinations veterinarians use so-called titering. A bit of blood is drawn, and this is checked for the amount of antibodies against Distemper, Hepatitis and Parvo. These are the three vaccines present in the DHP-cocktail. The amount of antibodies is rendered on a strip with four dots. The upper dot is the control dot, those below show Hepatitis, Parvo and Distemper. When titering shows the amount of antibodies is sufficient, it is not useful to vaccinate. The vaccination will simply be in vain. By titering we can determine whether it is useful to vaccinate – by vaccinating we can only guess or hope whether it is useful to vaccinate. This means titering has advantages, because to measure is to know. Image 1: Titering strip of an 8 year old dog. 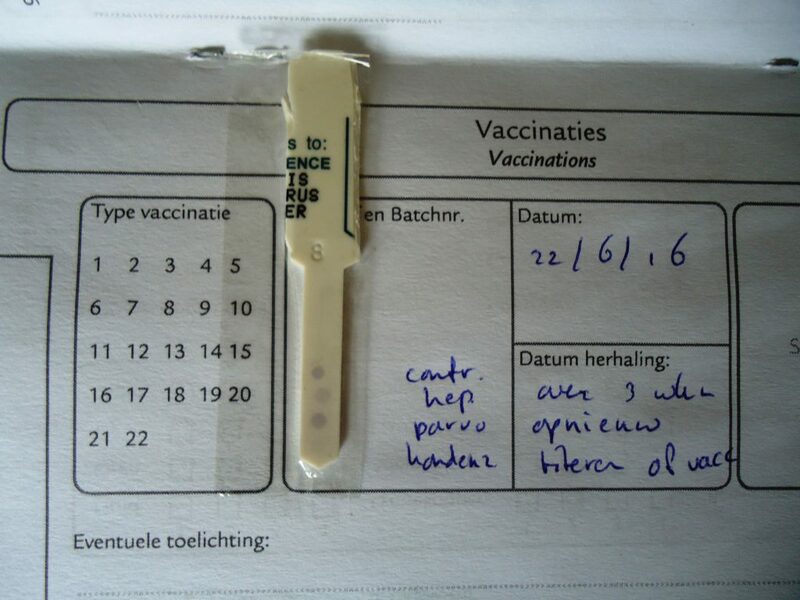 She was lastly vaccinated two years ago, and lastly titered one year ago, showing that vaccination was unnecessary. The lower three dots are significantly darker than the upper control dot. This dog possesses a generous amount of antibodies against Hepatitis, Parvo and Distemper. Based on these results it would be pointless to vaccinate this dog, and combined with the veterinarian’s expertise it was decided to give this dog ‘off’ vaccines for two years. After these two years vaccinations would have to be reconsidered by doing another titering. Image 2: Titering strip of a 4 year old dog. The lower three dots are clearly visible and show that she contains sufficient antibodies so vaccination would not be useful. This dog was vaccinated in her first year with the large cocktail, in the second year just with Leptospirosis, and after that she was not vaccinated anymore based on titering. She still shows enough antibodies. Had this dog been vaccinated, the vaccination would have been no more than a useless toll on her immune system. Based on experience the veterinarian gave this dog off for a year. After that a new titering can be done to assess whether vaccination would be useful. Unfortunately titering for Leptospirosis is not possible. Contrary to Distemper, Parvo and Hepatitis, Leptospirosis is not a viral, but a bacterial infection. Furthermore there is Rabies, an obligated vaccination for dogs who will be going abroad. Titering for rabies is possible, but the results are not considered as a legal alternative for the vaccination on the passport, so this is not done. Results of titering, just like vaccinations, are listed in the pet passport, and are legally valid in the Netherlands. To measure = to know, what does this mean for puppies? Puppies can also receive tailored vaccination, and the breeder can start when they are still in the litter by titering at the age of 6 to 7 weeks. Puppies receive antibodies through their mother’s milk, this is called maternal immunity and gradually decreases as the puppies age. In natural circumstances the puppies would encounter bacteria ‘in the field’ and build up their own immunity against diseases. Because until recently the presence of maternal immunity could not be verified, puppies would be vaccinated according to a schedule, at 6, 9 and 12 weeks of age. It has been acknowledged for a while that vaccinations are useless when there are sufficient antibodies, and the reason pups are vaccinated three times is because it is assumed at least one of those vaccinations will be useful. By means of titering it can be assessed whether is it useful to vaccinate – by vaccinating according to a fixed schedule this can only be guessed. To vaccinate a pup that contains sufficient maternal immunity is beyond any point. When the maternal immunity has disappeared the pup will no longer be protected. While the intent of a vaccination is to protect a pup well, the exact opposite will happen in this case, and the vaccination will turn out to be a hoax. 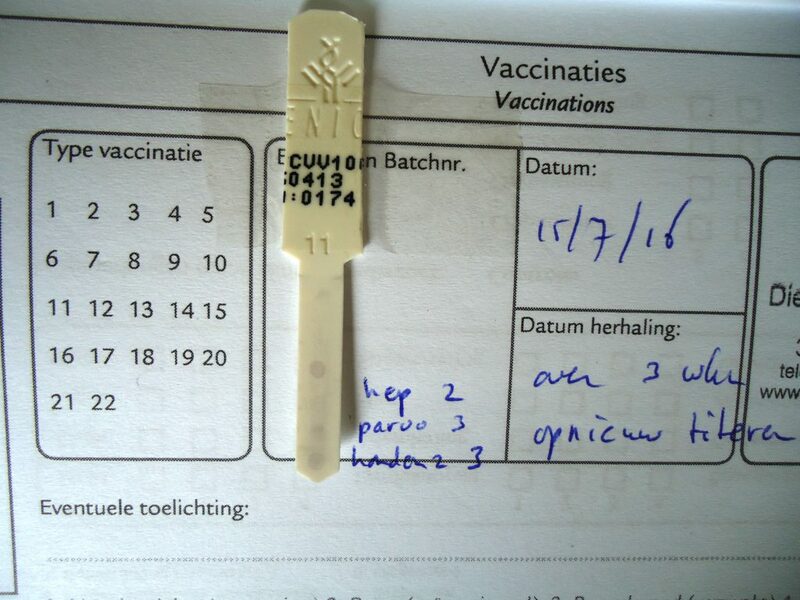 Because Distemper and Hepatitis hardly exist anymore in the Netherlands, the amount of antibodies for Parvo are often used as reference whether to vaccinate a pup or not. Would the pup be vaccinated when the dot for Distemper is invisible, while the dot that represents Parvo is clearly visible, then the pup would be protected against diseases that are quite uncommon but possibly not against Parvo, while Parvo actually is a very real threat for pups! For that reason it is often recommended to vaccinate puppies when the Parvo-dot with value 0 or 1 is hardly or not at all visible anymore. It is also possible to see the values for Distemper and Hepatitis at 2 while the Parvo value is quite low. Depending on the situation and infectional pressure of the environment sometimes vaccinations can be delayed. When all the values have eventually dropped as low as the Parvo value, vaccinations can be given. Often it is recommended to titer again a few weeks after the vaccination to see whether it had the desired effect. In this manner we can not only value the use, but also the efficiency of the vaccination, after all: to measure is to know! It is recommended to find a veterinarian that is experienced in titering, especially when you want to have puppiess titered. Some veterinarians offer the possibility of titering but are overly cautious when interpreting the strips due to inexperience, and advise too easily to vaccinate after all. As long as the maternal immunity is still present, vaccinating is completely useless and even unwanted, so it is wise to find a specialist when titering puppies. Titering is the way to facilitate tailored vaccination, and we are convinced that this will be the feature and eventually the standard! Image 3: Titering strip of a six week old puppy. The image above shows the titer value of this pup’s mother. The lower three dots each represent which antibodies the pup received from her mother, and despite the fact that the mother was lastly vaccinated three years prior she showed the presence of sufficient antibodies, and thus provided excellent maternal immunity to her puppies. The lowest dot is barely visible, but the Parvo value is still quite high. Because the Parvo dot is the reference point, vaccination at this moment was useless, and the veterinarian recommended to do another titering three weeks later. Image 4: Titering strip of the same pup, three weeks later. Because the Parvo dot was still clear enough, it was decided that a vaccination at 9 weeks of age was still not useful. To summarise: it is definitely worthwhile to examine the possibilities of tailored vaccination.